Binalakshmi Nepram, the courageous human rights defender and author from Manipur was on Thursday chosen as one of two winners of an annual award recognizing women human rights workers. Nepram shares the Reach All Women in WAR (RAW in WAR) Anna Politkovskaya Award with Nobel literature laureate and an investigative journalist Svetlana Alexievich from Belarus. Ahead of the 12th anniversary of Anna Politkovskaya’s murder on Sunday, RAW in WAR honours Binalakshmi Nepram and Svetlana Alexievich with the 2018 Anna Politkovskaya Award for their ‘bravery in speaking out and in defying injustice, violence and extremism’ in the context of ‘forgotten’ armed conflict in their regions, for which they have suffered death threats and as a result of which Binalakshmi had to go into exile to save her life. She believes that, if she goes back to India, she could suffer the same fate as Gauri Lankesh, the Indian journalist and co-winner of the 2017 Anna Politkovskaya Award, who was assassinated to silence her voice. Binalakshmi co-founded India’s first civil society organization to work on disarmament and to oppose growing militarization, the Control Arms Foundation of India (CAFI). 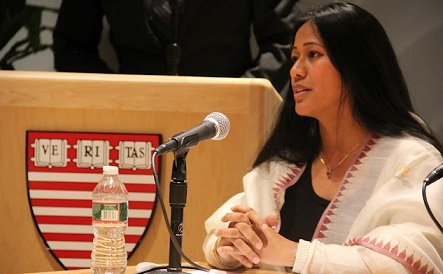 In 2007, she launched the Manipur Women Gun Survivors Network, which has helped more than 20,000 women survivors of gun violence in the 70-year-long armed conflict in Manipur to rebuild their lives and obtain justice.